This piece originally appeared in Rumor & Truth and is translated and reprinted with permission of the publisher. On the left, the doctored TIME Magazine cover featuring Tsai Ing-wen smiling at a police officer eating a take-away lunch in flood ravaged Southern Taiwan. On the right, a blurb of text explaining the English text on the cover. Please do not re-share this image for the purpose of duping others. After the disastrous heavy rainfall that hit Southern Taiwan this August, the Tsai administration and the local government faced criticism for its poor handling of relief efforts. 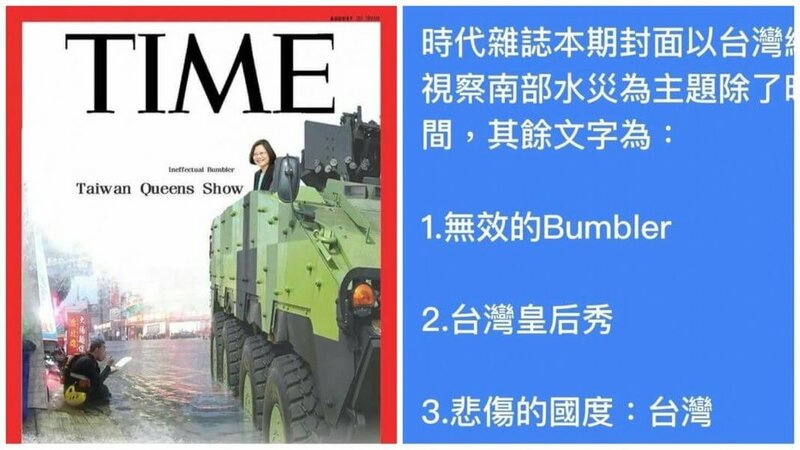 But a recent issue of TIME Magazine lambasting Tsai? Sorry, that’s a rumour. There was no issue of TIME published on August 25th, and the TIME Magazine cover corresponding to the week in question features tennis star Serena Williams. That’s all there is to it. Copyright © 2018 Rumor & Truth (蘭姆酒吐司). All rights reserved. Still not sure how to reply to the rumour your Mom posted on social media? Do you fret about receiving a ton of annoying fake news posts every day? Well bring it on! Rumor & Truth is here to help you fact-check online rumours for you! Our mission is to break through internet rumours, restore the truth, and let you get on with your life.